Working at a place like Wildwood never gets old, but we do become quite accustomed to the presence of world-beating instruments. We still get excited—we’re only human, after all!—but we don’t lose our minds every time we see a great guitar. If we did, we’d never get any work done! Nevertheless, we still get some guitars that bring our productivity to a screeching, grinding halt as we all crowd around the case and jostle to determine who gets to play it next. 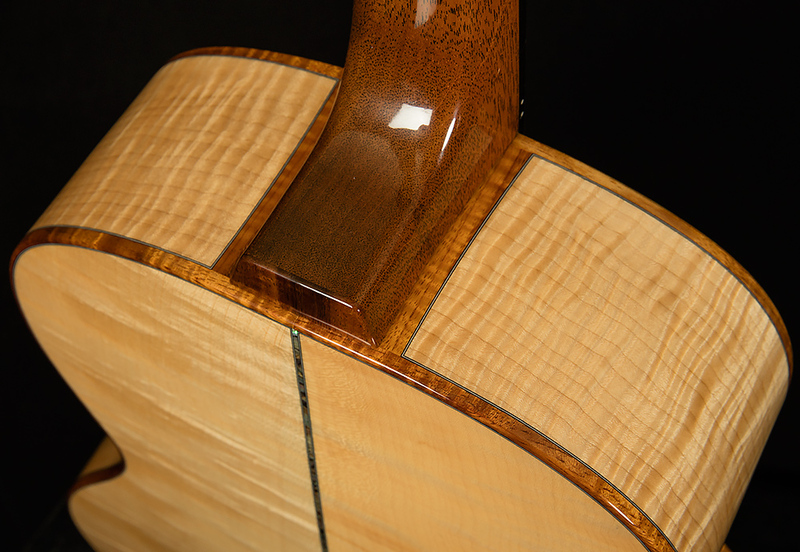 This tiger maple A-12 from our friends at Froggy Bottom is one of those rare heart-stopping instruments. Here’s a quick anecdote that illustrates the depth of our love and appreciation for this instrument. Our acoustic expert Brian and I were playing each string open and discussing their respective tonalities (the nerdery runs deep here, Wildwoodians) when our shipping manager, Devyn, chimed in. In our defense, the B string sounds as perfect as can be. 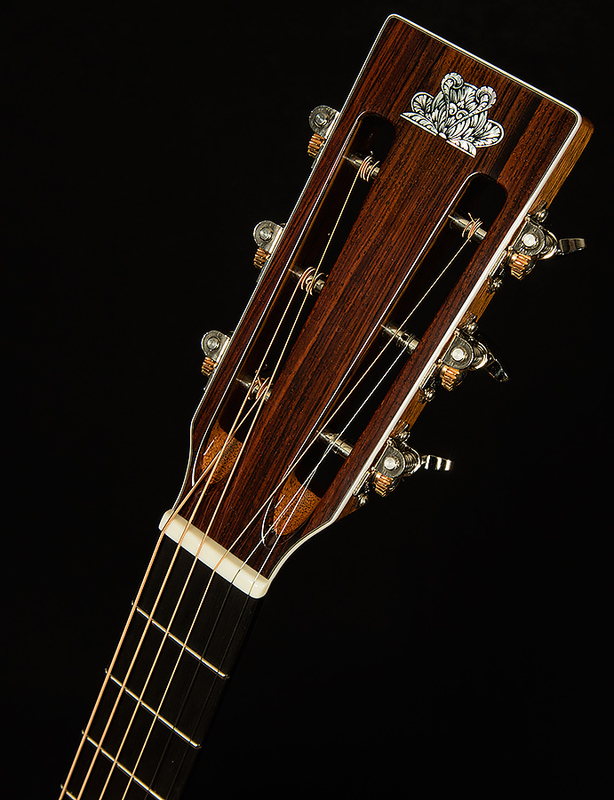 Oftentimes, the trebles on maple-backed guitars can sound tinny or plinky, but that is not the case with this serial. 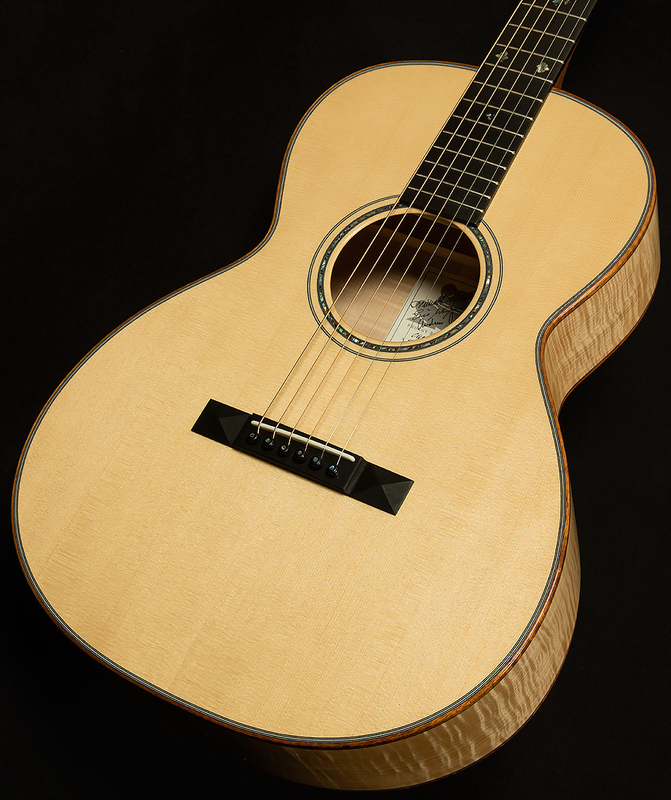 This guitar’s trebles are round and pleasant, with a glorious amount of mass and heft. They sound big and bold and beautiful, but there are a plethora of other sonic features that demand the same sort of nerdy deep dive. For instance, the attack! Oftentimes, new guitars with maple backs and sides have a percussive, aggressive attack that practically bites you in the eardrum (which is certainly a cool sound—think Pete Townshend on those Who records!). Not the case with this A-12! 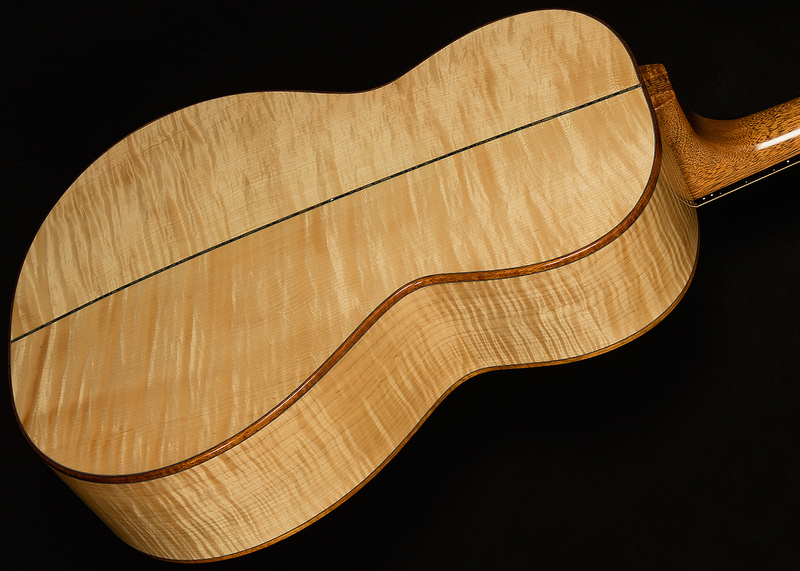 It is the roundest-sounding maple guitar, new or vintage, that I have ever laid hands on. The attack goes thoomp like a wooden cannon, and this guitar has enough headroom that it’s almost impossible to make the front end of the note sound harsh. After this initial beautiful round attack, you can hear the fundamental assert itself with great strength and power in the basses and the low midrange. This clear, warm, woody low end has surprising muscle for a small-bodied guitar, and it provides an excellent foundation for the broad, open midrange. 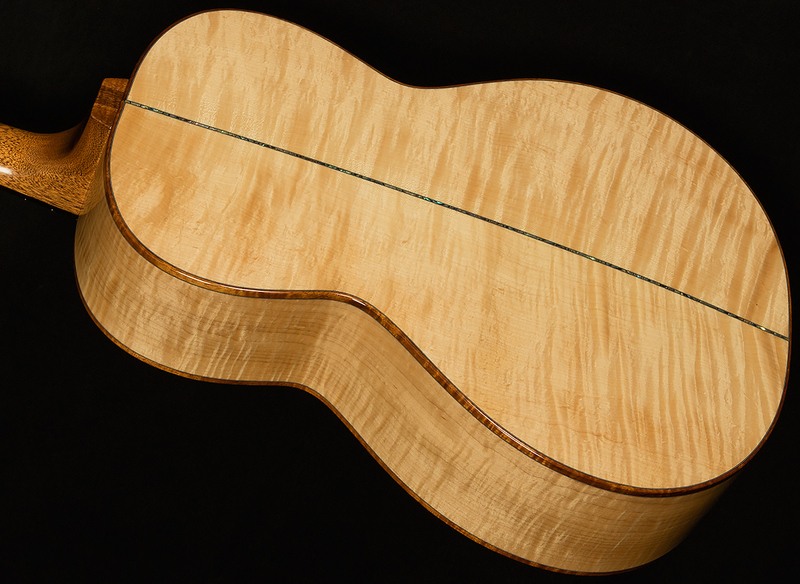 Much of this tonal evaluation has been about how this Froggy Bottom defied our expectations of what a maple guitar can be. However, it does exhibit one of maple’s classic characteristics as well as any guitar I’ve ever played: clarity. Actually, let’s back up, because the word “clarity” doesn’t quite do this guitar’s voice justice. Playing this guitar is like watching Planet Earth on a hi-definition television after a lifetime of watching Wheel of Fortune in standard definition. You can hear all sorts of shades and hue that simply aren’t normally there. For instance, one of my favorite chords is a Dmaj7 with the high E ringing over the top. I’ve played it and let it ring on thousands of guitars at this point to test their clarity. Music makes me see colors, and normally that chord evokes blue and purple hues. However, when I played it on this Froggy, I heard every possible shade of purple and blue that Sherwin Williams sells, plus a couple in between that don’t have names. Now, I’m not saying that this guitar will make you hear Picasso paintings when you play jazz chords, because the way I hear things is different from the way you hear things. What I am saying is that the word “clarity” is an inadequate descriptor for this guitar. “Clear” carries too many connotations of sterility, and this guitar is anything but sterile. This guitar has a clear voice, but it contains so much beautiful harmonic information that playing it is a borderline-synesthetic experience. Playing a complex chord is like giving your eardrums a bath in an ocean of vivid colors. This spectacular rainbow-soaked sound makes for a truly one-of-a-kind playing experience. 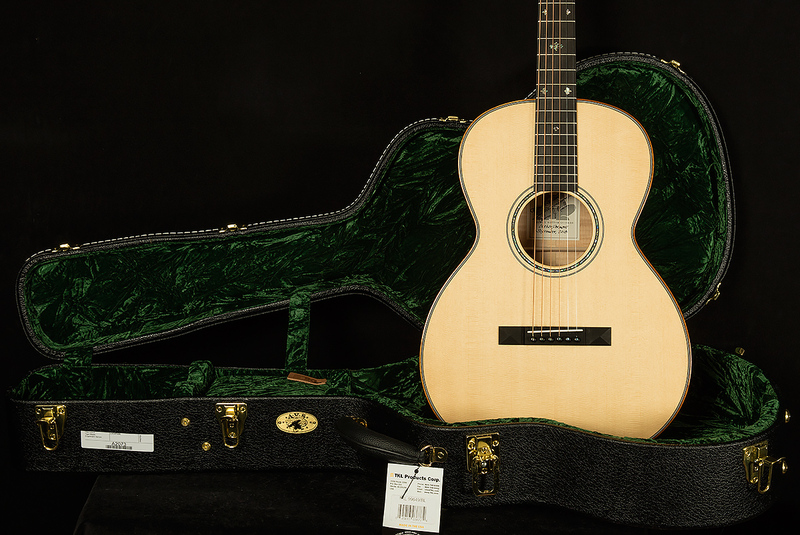 We’ve never had a guitar quite like this one before, and we are so proud to showcase it for our exceptional customers. What will you paint using this masterpiece as your brush? We’re excited to find out!